On this All-Star weekend, Nike used the entire side of a building to let you know that they’re actively solving the problem of racism in the world. Across from the Superdome, a giant image of New Orleans Pelicans power forward Anthony Davis graced the side of a building next to the word “Equality” and the Nike swoosh, marking it as part of the advertising campaign launched by LeBron and others last week. Anthony Davis explained the idea of the campaign to USA Today, “That (ad) is basically saying ‘Whatever size, shape, color, it doesn’t matter; on and off the floor, everybody should be equal, That’s what we preach over at Nike. What we’ve been preaching the past couple weeks is equality, especially with everything that is going on. 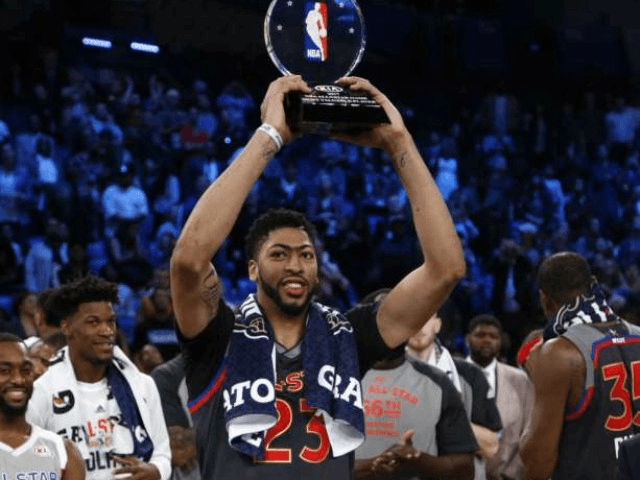 Davis’ teammates in New Orleans will likely rejoice at hearing Davis say that all players should get equal treatment. Davis, the former number one overall pick and largest member of the team makes eleven million dollars more this year than the next highest-paid player, and makes nearly twenty million dollars more than the recently traded Buddy Hield. So, in order to comply with the NBA’s salary cap, if Davis truly believes all players of all shapes and sizes should get equal treatment, he’ll likely have to part with some serious cash. If the NBA were 75% white, no one would champion the league as a font of equality. In fact, the league would likely find itself before Congress, explaining why they lack diversity and equality. And of course, none of this exempts Nike itself from the charge of hypocrisy. As Fox Sports’ Clay Travis points out, while extolling the virtues of equality, Nike uses cheap foreign labor to produce their products. Travis said, “Nike is making money hand over fist because they’re only paying their workers three dollars a day to make (their shoes) in Indonesia. If equality is everywhere, doesn’t Nike actually have to treat its employees equally? Doesn’t Nike have to actually bring its brand to American shores and make this sneaker inside of our borders and actually pay people in America to make a shoe they’re asking people to buy? Despite these gross hypocrisies on the part of Nike and the players who represent them, NBA Players Association president Michele Roberts views the social activism of the players as a good thing, and vows to do what she can to see that it continues. Roberts said, “Our players don’t relinquish their First Amendment rights when they become members of the league. And so, I view – we view – the role of the (NBPA) as making sure that there’s no effort to infringe their rights to express themselves when they deem it appropriate. I guess Roberts was sick the day Steph Curry suggested dropping the “-et” from “asset,” in order to accurately describe his views of President Donald Trump. Some might consider that inappropriate.